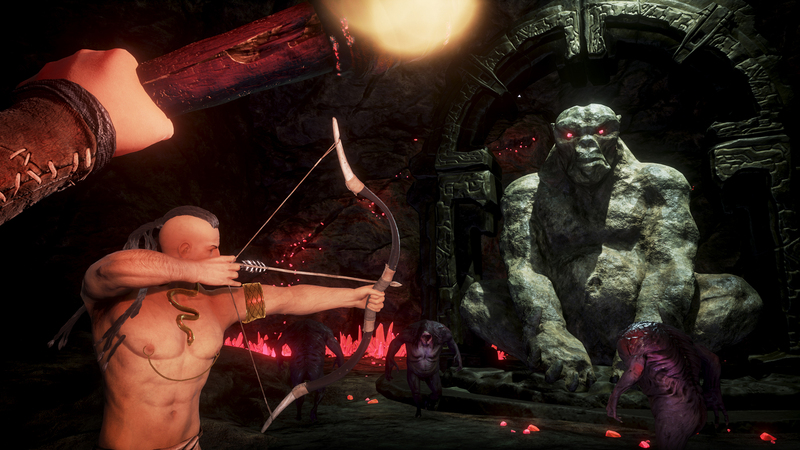 Conan Exiles is scheduled to launch into Early Access on Steam in just a few days, bringing survival and crafting gameplay to the harsh world envisioned by Robert E. Howard. We got the chance to ask a few questions of Tor Egil Andersen, Communications Manager at Funcom, from the basics about setting and lore to some nitty gritty details about specific mechanics and systems. Dive into the interview below for more information on this upcoming survival title, and visit the Official Conan Exiles Wiki for information on weapons, creatures, and more. There are obviously tons of excellent survival games already out there. Beyond the Conan name, what gives Exiles its own identity? Many things give Conan Exiles its own unique flare. The most obvious point is that the game is set in the world of Conan the Barbarian. This means that Conan Exiles can draw inspiration from a vast world full of great stories and thousands of years of history. 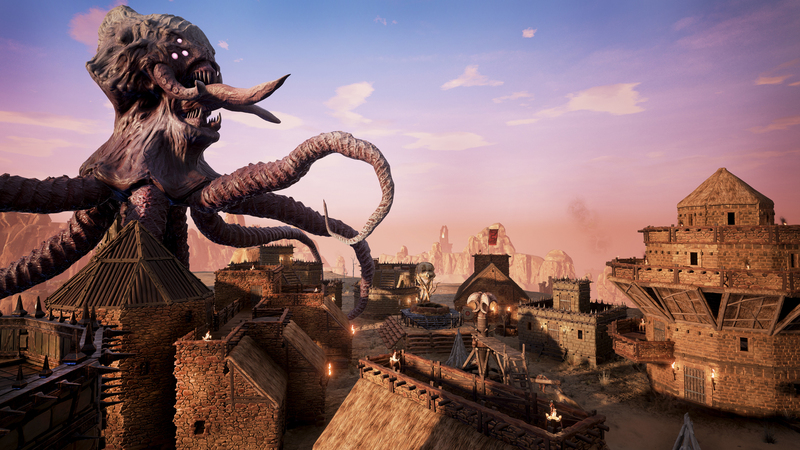 Conan Exiles is nothing like an empty sandbox – the Exiled Lands you will be playing in have an incredibly rich history and backstory. You will be discovering deep lore and uncovering mysteries as you play. The landscape is filled with unique locations, from deep caves to abandoned arenas and even city ruins filled with corrupting magic. I’m a new player, just made my character, freshly dropped into the world. What are my first steps in Conan Exiles? You start the game by being cut down from a cross by none other than Conan himself. Though Conan is free, you are trapped in the Exiled Lands and cannot escape. Your first needs will be food and water, so you should head north towards a big river delta and out of the barren desert where you had been crucified. The river lands are filled with dangers though, so you will quite quickly need to build a shelter to protect yourself from aggressive creatures or the punishing sandstorms. Other players may be the greatest threat, so you also need to arm yourself quickly and be ready to fight anyone who attacks. How does leveling work? Is it a standard experience system? How do we improve attributes and learn new recipes? You earn experience points (XP) from playing the game and doing normal things, like crafting, harvesting resources, and killing enemies. When you've earned enough XP, you will level up, and for each level you will get points to spend on improving attributes and learning new recipes. The ‘Level’ button on your character sheet will be blinking when you have points to spend, so it is easy to see when you can improve your character. What benefits does forming a clan and working together with other players confer? There are great benefits to joining together and forming a clan. Everyone in the clan can build together and share resources. They can also craft weapons and armor for each other, which allows them to specialize in different areas. It is extremely helpful to work together when capturing thralls, and every thrall captured belongs to the whole clan. You will all enjoy the protection of the thrall archers and fighters you capture, and artisan thralls can help improve your industry and unlock more powerful recipes. The greatest advantage from being in a clan is probably being able to gather favor for the gods together. You need a lot of favor to upgrade your altar and summon an avatar. Working together as a clan will greatly speed up this process. What are the basics of combat? Do certain weapons have advantages over certain types of enemies? Is there another game you could point to as an analog for how Exiles’ combat feels? Combat is fast and brutal, but also quite tactical. You can block with shields, do attacks from both the left and right, do special attacks, and even throw weapons. There are a variety of weapons to choose from in Conan Exiles, and yes - some are particularly good in some situations. When charging archers, you will want a shield to block their arrows, and when fighting vicious beasts like crocodiles, the extra reach of a pike can be very useful. The development team has drawn inspiration from Skyrim and Dark Messiah of Might and Magic when designing the combat system. How does capturing thralls work, and what sorts of benefits do enslaved NPCs provide? You capture thralls by knocking out NPCs, dragging them back to your base, and breaking their will on the wheel of pain. Thralls can help guard your base, help you craft, entertain you, and unlock powerful advantages such as flawless weapons or even avatars. Thralls are an important part of Conan Exiles, as they give their owners many benefits and can tip the balance in conflicts between players. You can also raid enemy bases and capture their thralls. Thrall Dancers are said to remove corruption inflicted by particularly horrific monsters. How does the corruption system work? Many of the dark places in Conan Exiles are filled with corrupting magic. When you explore deep caves or ancient ruins, the magic which still lingers there slowly corrupts you. When you fight magical creatures, such as demons or undead, their very presence spreads corruption. Corruption permanently reduces your maximum health, and the more you are exposed to the corruption, the worse it gets. When corrupted, you need to spend time in the presence of entertainer thralls to remove it. Once the corruption has been removed, your maximum health will return to normal. Even though it is dangerous to seek out such dark places, they are often filled with valuable treasures or mystical lore. We know you’ll be able to choose to worship different deities, and that you’ll unlock bonuses based on your progress in that path. Can you give some specific examples of what benefits players will receive from the religion system? You will be able to build altars to your god, and as you bring your god favor, you can upgrade these altars. Each tier of altar for each god allows you to craft specific items, such as very high quality food, antidotes, or special weapons. If you have the highest tier of altar and an arch priest, you will eventually be able to summon your god’s avatar to smash your enemies. The ability to summon massive divine avatars to wreck enemy bases seems like an especially powerful one-- how is that balanced in-game? There is a server setting which removes the ability to summon avatars, so you can choose to play on a server where nobody can have them. It takes a lot of work, favor, and resources to summon an avatar though, and all that effort is consumed in the process. Also, the summoner himself is extremely vulnerable during the ritual, as a massive beam of light clearly marks his position for anyone to see. If he is killed while summoning or while controlling the avatar, the avatar instantly disappears. The summoner can also only control the avatar for a very short time, so he will be limited in how much he can destroy. Is there a story in Conan Exiles? How does that take shape in the game? Yes, there is a story both behind the Exiled Lands and why you have been banished there. It is up to players themselves to discover pieces of lore to learn more about this place. More pieces of the story will also become available after the start of Early Access. Is there a specific version of Conan lore you’re hewing more closely to for the game, whether the films, novels, or comics? Our Creative Director Joel Bylos draws most of his inspiration from the original Robert E. Howard stories of Conan the Barbarian. The events in Conan Exiles take place on Conan’s timeline between the stories Xuthal of the Dusk (The Slithering Shadow) and A Witch Shall be Born. 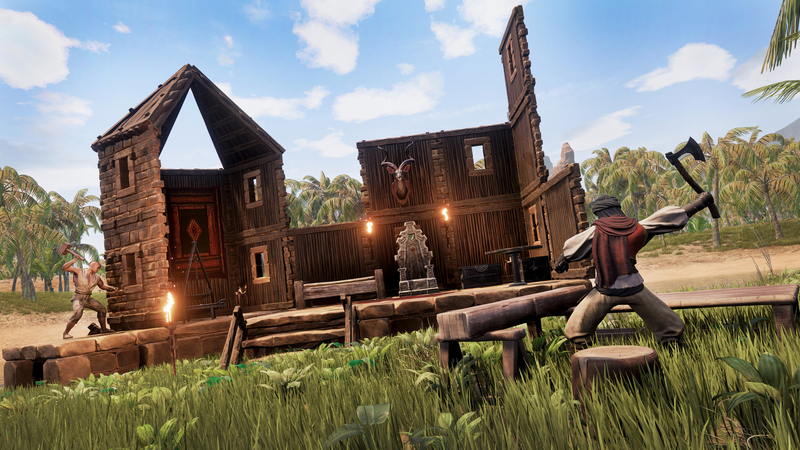 Players will obviously be able to build crafting stations and religious altars, as well as general purpose buildings. Are there other types of structures as well? Will players see specific benefits for building, say, an armory or a temple? Players can build a host of different crafting stations. The largest pieces they can build are huge vaults for securing their most valuable loot, tier three wheels of pain, and tier three altars. If players want to build large castles, temples, or towers they will need to do so by putting together regular building pieces. Do you have a specific map for all the features that will make their way into the game over the course of Early Access? Or is the plan to allow the community to shape the direction of the final game? We have plans for future updates that we wish to make, and these will be made available on conanexiles.com. We will also listen very closely to the community during Early Access. They will be an important tool for improving and expanding the game. For more information on Conan Exiles, visit the official website or the Official Conan Exiles Wiki. 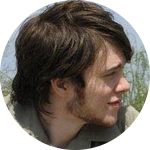 Dustin is a Missouri-based freelancer who most of all enjoys long walks in digital woods. His work has been featured everywhere from Gamepedia to Anime News Network, and when he's not writing about geeky pastimes, he's producing videos on them. He and his wife bond best over tabletop role-playing.